Hi everyone, got some birthdays coming up so need to get a stash of cards ready! This butterfly was cut from a scrap of watercoloured paper. (I used the bigger panels behind some diecuts for a stained glass effect). The happy diecut was inked with versamark and sprinkled with aged black frantage. When heat embossed it gives a great enamelled look. At Less is More it's recipe week, add dimension. I've popped the butterfly up on foam dots to add dimension. 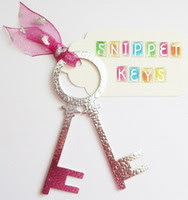 Using the scrap of watercolured paper means I can pop over to the snippets playground at Pixie's Crafty Workshop. It's anything goes at Simon Says Stamp Wednesday. (with the option of using the inspirational bible verse on your card too). 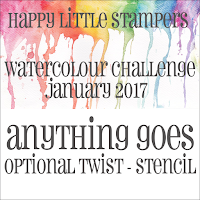 At Happy Little Stampers Watercolour Challenge it's anything goes with the option of using stencils. I've used a scrap of watercolour paper painted with a mixture of Kuretake Gansai paints and some Finetec gold shimmer paint, for the butterfly. Stampin Up Beautiful Butterflies Bigz die; Memory Box Moonlight Butterfly die for the body; Kuretake Gansai & Finetec gold watercolour paints; Poppystamps jumbled birthday die; versamark ink and aged black frantage embossing enamel; Kaisercraft birthday stamp, versafine ink & clear ep; Stately embossing folder. What a beautiful butterfly and a gorgeous CAS card! Thanks for joining us at HLS Watercolour Challenge! As always Cathy a beautiful card with a wonderful butterfly. 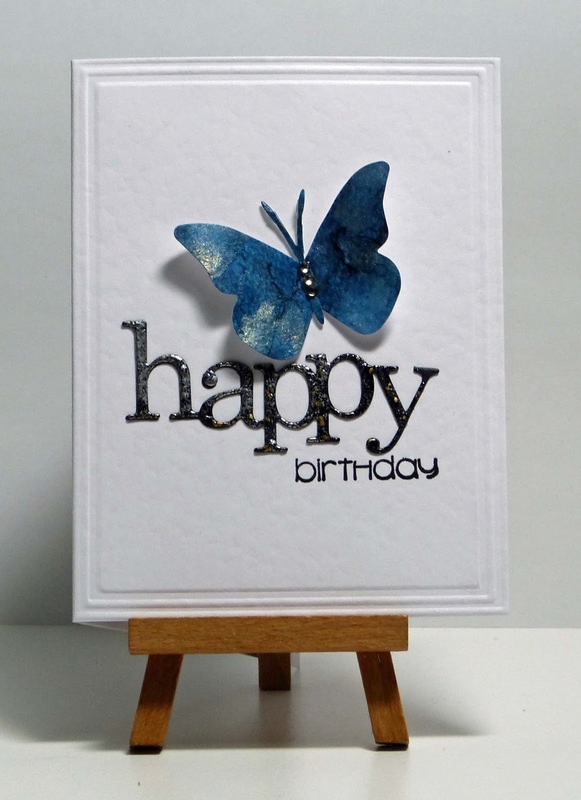 A lovely card, great design and beautiful butterfly. Gorgeous card! I love the effect on the butterfly, and the embossed border. Thanks so much for playing along with us at Less is More, and Happy New Year! Really lovely card Cathy - great use of a snippet for that butterfly as well! Fantastic looking card. The big bold sentiment is perfectly paired with the lovely butterfly. LOVE IT. You make the most beautiful butterfly cards and this is another great one. When I make this larger it looks like metal because of the shine. So pretty. This is beautifully CAS, Cathy! I love butterflies and the heat embossed "happy". Thanks for playing along at HLS' Watercolor Challenge. Such a pretty butterfly, such a beautiful CAS card! Such a beautiful card and butterfly. Stunning card - love that beautiful butterfly! Cathy, that butterfly is simply gorgeous! You've also managed to fit in with quite a few challenges! My hat's off to you! I can rarely get my card to "fit" two challenges! Beautifully CAS, I love the blue butterfly and the embossed greeting. Gorgeous CAS card Cathy! It's so elegant and pretty. Gorgeous watercolor butterfly, Cathy! And your enamel look sentiment is stunning! Thank you for including this beauty in HLS' watercolor challenge! I love how dimensional your beautiful butterfly is, and the embossed edging to your card is a lovely effect too. Wow, just beautiful! Congrats for the Less is More win - well deserved! I had to pop over for a closer look. Gorgeous card! This is beautiful, Cathy. 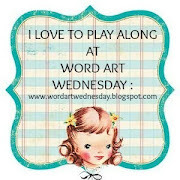 Thanks so much for playing along in our challenge at Word Art Wednesday. It's a blessing to have you join us, and I hope you'll stop by again soon. Have a blessed week. Yupo and alcohol ink flower. Happy Anniversary with washi tape.